Ability Text: Exchange control of two target permanents that share a type. 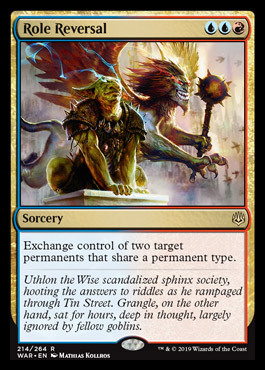 Flavor Text: Uthlon the Wise scandalized sphinx society, hooting the answers to riddles as he rampaged through Tin Street. Grangle, on the other hand, sat for hours, deep in thought, largely ignored by fellow goblins.